Because I think you need another refresher on how I feel about gnomes, I’ll also invite you to revisit my post Are Gnomes Real? You Tell Me. My love for gnomes goes way back to my childhood, and I just can’t get enough of those cute little bearded fellows. It was only a matter of time until I gave them their own little corner of Big Creek to dwell in! I have lots more plans for another gnome village garden here on the property, but I’m so happy to have the first little colony up and running. When it comes to gnome garden ideas, I have had plenty. I’ve spent entirely too many hours surfing the web looking at miniature gnome gardens, and used up pages and pages of sketch paper drawing up my own ideas. I don’t have a ton of spare time for this kind of stuff, which is why it has taken me over two years to actually get anywhere with having my own miniature garden village to gaze at. I have always had an active imagination, and I’m so happy that has carried over into adulthood for me….even middle-aged adulthood. I still envision gnomes living inconspicuously in the forest floor, and I love to imagine what their little villages are like. I spent so many hours as a child exploring the woods around Big Creek and looking for gnome activity! 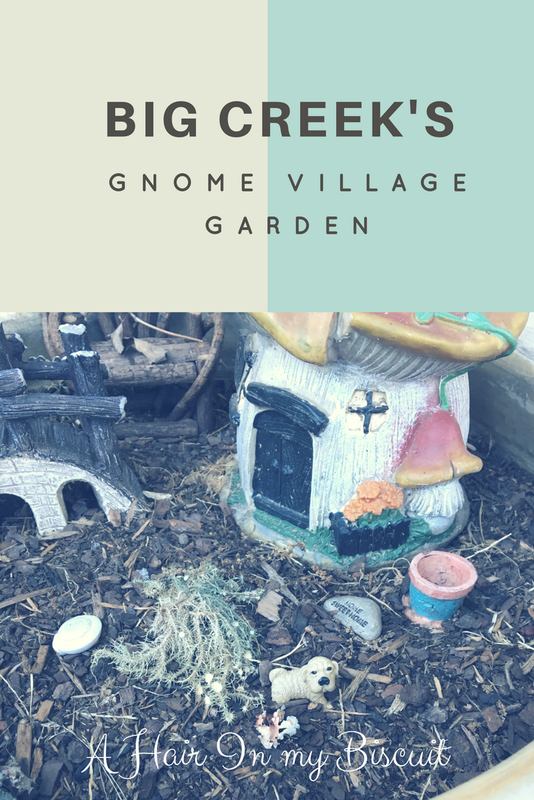 Having ideas for a gnome village garden was not something I really had to to do a lot of research for, but it sure is fun to see what others have created in the way of miniature gnome gardens. Madre and I were out goofing off one day and ran across a sweet display of gnome garden ornaments at Big Lots. We both got so excited, because she knew how much I wanted to do this project! We bought a few things and kind of just stuck them in my spot. I knew that I not only needed more, but I also needed a way to raise the whole scene up off the ground to make it more visible. See how all my gnome garden decor kind of got lost in there? Thanks to lots of gift cards I received for Christmas, I was finally able to get a great start on my little gnome village garden here at Big Creek. Coach, Pooh, Tigger and I went on a shopping spree together, and they helped me choose the perfect pieces for my little village. I’ve included as many links as I could to help you find your own miniature garden village decor, so I hope that helps if you’re looking to start your own little village. I couldn’t have found anything better than this adorable No. 3 washtub stand! I LOVE it, so much, and it’s the perfect size for my favorite gnome garden house, the chicken coop, and the adorable outhouse I found. This slightly smaller aluminum container created the perfect setting for another gnome homestead. I also couldn’t resist this awesome metal “tire swing”, which holds my sweet little gnome playground (I couldn’t find the link for the tire swing, sorry!). The gnome riding the snail and the swinging gnome were absolute must-haves for me, and they just fit perfectly in my metal tire swing planter. Aren’t they so adorable? With the weight of the dirt and the gnome garden ornaments, this swing really stays put! I was a little concerned a strong wind might come up and toss these little guys on their heads, but so far so good. I had to dig around the place to find a couple more pots to house all of my finds, and I’m just thrilled with how they all turned out. Isn’t the little mushroom dinette to die for? That has to be one of my very favorite things that I found for my little fellas. I’m also pretty crazy about the sweet little garden stones with sayings on them…I think I have one in each pot. I’m in love with all three houses that I found, and the little pieces of moss and lichen that I’ve collected and added to the scene are just perfect. My sweet little bentwood chair was a gift from my boss, and there’s another chair and a bench to complete the set! I’m certainly not finished with my gnome village garden, but I definitely think I’m off to a great start. I really do want to paint the backdrop someday, and I need to make time and just do it. I’m a bit of a procrastinator when something intimidates me, but once I start a scary project it almost always goes smoothly and quickly. I just have to get off my tush and do it! The giant gecko that has hung from the rafters of the shop building forever is still there, and I think it fits nicely. It makes my gnomes seem even smaller, which is pretty cool! I hung these cute black lanterns along the rafters, as well, and I’ve already purchased some battery-operated tea lights to put in them. I love sitting on the back porch now and looking at my adorable miniature gnome garden! The best part is, it’s a garden I don’t have to water! I promise to keep you updated on my progress, but you know it might be a while. Please leave me a few words in the comments and let me know what you think! If you have ideas, I’d love to hear them! I see this as an ongoing project, and I have so much more in store for these little guys. I love hearing from you, so any suggestions are welcomed! I’ve already made some changes here and there, and added things as I find them. I hope you start your own gnome village garden, and that you’ll share it with me! You can tag me on Instagram @AHairInMyBiscuit any time. Happy gardening! Best Chicken Enchilada Casserole	Mexican Chicken For Tacos… Ay Caramba!